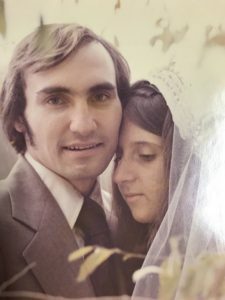 It was 41 years ago that Susan and I were married. The fall day was perfect and the wedding ceremony and reception went smoothly. Many family and friends were present as well as many people from our faith community. 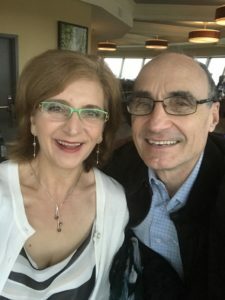 After 41 years we are still happily married, enjoying each other’s company, and looking forward to many more great years together. Neither of us have any regrets about the lifelong partners we chose for ourselves. We had gotten married when we were both in university, we knew that finances would be tight because we did not want to take out loans for our education. So we both worked long hours during the summer, frugally saving money for the time when we would be leaving home and then really need it. In the midst of the long hours of work, we planted gardens in people’s back yards and then proceeded to clean, process and preserve the vegetables, fruit and tubers so that we would have food for our married life. This taught us how to work together and to persevere when hard work was required to obtain whatever resources were needed. In the midst of many temptations and desires ,we determined to remain morally pure, abstaining from sexual activity till after the marriage ceremony. This does not mean that there were no emotional or physical longings but we knew that doing what is right is always better than living by emotions or feelings. This same level of self-control is essential for all seasons of our lives, as righteous living can rarely come about if driven by our feelings. We determined that our Christian faith needed to be woven into the marriage ceremony, but especially into every aspect of our lives. In the wedding ceremony we included Christian principles into the service, the music and the vows that we wrote. But the service itself was not the only Christian aspect of the day. After the ceremony and after some picture taking we pulled apart from the people, to go to a small church building where we took an hour to pray together, personally dedicating our new lives together to the purposes of God. Inviting Him to work in our lives and calling upon His strength that we might live lives that glorify Him. This starting in prayer was not new to us, for though our early friendship and dating process we regularly went to church, prayed together and discussed the scriptures together. Then after marriage it was and still is a common part of our lives. After praying for that hour, we then noticed that we had left a path of confetti throughout the entrance and sanctuary of that small building. So being faithful to clean up the mess that we had made, we found some vacuum cleaners and proceeded to clean the building. Yes, this was on our wedding day, but we knew that if you make a mess, you need to take the time and effort to clean up the mess. Many times in our relationship we would make messes, say something wrong, act selfishly, or be inconsiderate. But we knew that if you make a mess you need to clean it up and that our Lord will be there to help in that as well. Much more could be shared about the necessity of seeking to understand your spouse’s perspective, forgiveness, sacrificially serving your spouse, or learning to be content with the provision of God, but perhaps at another time. Our desire for you is that, through the work of Jesus in your lives, you would find the comfort and strength that is available to you in your relationship with Him and in your relationships with those around you.